Medical coding is more and more becoming part of the insurance processing landscape in the general dentist office. This from the state of Maryland but a preview of things to come with other state requirements. Diagnostic Code ICD-10 Z3A.00 to be on claims for all pregnant patients with the Health Smiles Program January 2017. Perhaps you have already seen it if you have an office in Maryland, that participates with the Health Smiles program. I suspect that this requirement will be implemented by each state’s medicaid program, not just Maryland, so please be proactive and check your websites for more information. 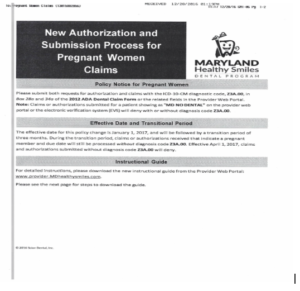 This requirement of a diagnosis code Z3A.00 for all patients who are pregnant begins Jan 1 but a grace period will be allowed during the first quarter when claims will still process without it. Don’t wait, though, get proactive to prevent denied claims.